I got a massive pile of fabric this week, but I'm not counting it. My sister paid for it and it's all going back to her...as a finished quilt...eventually. 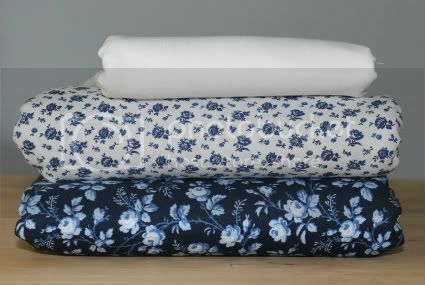 6.5 yards each of the Windham Wedgwood Delft, and 2.5 yards of Kona White, for a king size Hunter's Star. That would just make too big of a dent in my stash, so since it's not MY stash fabric, it's not counting. But it's awfully pretty to look at. In my own fabrics, I had a mostly-stash finish this week. I used six fat quarters from stash, bought two more, and used up the rest of the Steelers gold. 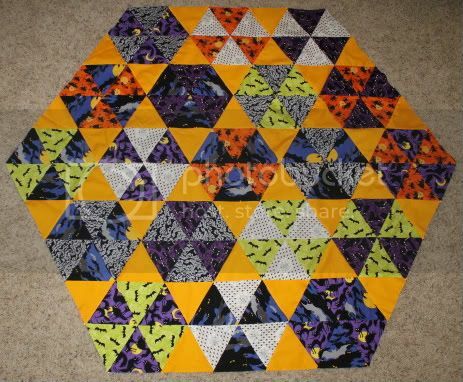 I already started piecing the back, and bought glow-in-the-dark thread to quilt it. I also bought a half yard for Mom's Tennessee Waltz's binding. The wonderful Paula already finished quilting it, so it'll get it bound this week. Yay! I broke 100 yards used!